The High Sierra mountains around Yosemite Valley, California, with their snowcapped granite peaks, and thundering waterfalls, have provided a lifetime of musical and spiritual inspiration for Adonda Records’ singer and songwriter, Rich Price, The Singing Sierran. Upon signing The Singing Sierran, Adonda Records of Nashville® initially set out to record and release three Western albums: the first, “Spirit of Yosemite”, was released in 2014; the second, “Cowboy Songs”, was released in 2015; and the third, “Western Songs”, was released in early 2017. These first basic albums were so successful that the label has prepared a fourth album, “Cowboy’s Cowboy” (release scheduled for 2018), and a fifth, “Pacific Man” (release scheduled for 2020). 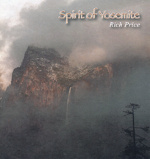 The first album, “Spirit of Yosemite,” was produced by multi-talented Harrison Tyner, Nashville music/TV industry executive and owner of Adonda Records of Nashville®, along with eight-time Grammy Award® winner and former RCA engineer, Tom Pick. They brought together some of Nashville’s most notable musicians, such as: Country Music Hall of Fame members, Harold Bradley and Charlie McCoy; Musicians Hall of Fame member, Jimmy Capps; Joey Miskulin of Riders In The Sky; Andy Reiss and Brad Albin of The Time Jumpers; and famed Nashville musicians David Smith and Bob Mater. The background singers were former members of the legendary Jordanaires: Michael Black, Curtis Young, Gary Pigg and Ray Walker. The second album, “Cowboy Songs,” was produced by Harrison Tyner and Tom Pick. Once again they brought together some of Nashville’s most notable musicians, such as: Country Music Hall of Fame members, Harold Bradley and Charlie McCoy; Musicians Hall of Fame member, Jimmy Capps; Joey Miskulin of Riders In The Sky; Andy Reiss and Brad Albin of The Time Jumpers; and famed Nashville musicians David Smith and Bob Mater. The background singers were former members of the legendary Jordanaires: Michael Black, Curtis Young, Gary Pigg and Ray Walker. “Everyone who’s ever sent a postcard from a beautiful place has some measurable appreciation for the beauty of the photographs, the sentiments written to express that feeling they experienced on their visit. It’s what they want to share with those they care about most. But it’s a rare and unique experience to hear those stories told from a first hand, voice of a generation, living, talking, singing real life cowboy. Someone who’s ‘rode’ the trails to Texas, pondered life above the Timberline, and reflected under the Sierra Moon – it’s all right there in this Cowboy’s Face. But before you get caught in a dust storm, rest assured this cowboy’s journey includes a mighty helpin’ of romance. So what you hold in your hand is indeed the authentic, impeccably recorded masterwork of ‘The Singing Sierran’, Rich Price. It’s a fitting and timeless tribute to his beloved Yellowstone. His songs are about love and life, each one from a page of his unique trail riding and exuberant cowboy heart. Recorded and produced by some of the most legendary and oft recorded musicians and producers in Nashville, TN, this recording will find you drifting (like cowboys do) down the trails and back up the mountain again to breathe in the landscape as you ride along with Rich. Saddle up and enjoy the ride, and as Rich says, ‘may every trail you ride be filled with sunshine.’” (Gary Pigg). Music became a lifelong source of inspiration when, as a child, Rich began writing songs and listening to artists such as Roy Rogers, Gene Autry, Hank Williams, Marty Robbins, Hank Snow, and later, Johnny Cash, Kris Kristofferson, and Willie Nelson. 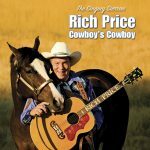 Rich’s songs appeal to a wide audience, because they are songs about life’s feelings that each and everyone of us experience, riding life’s many trails. 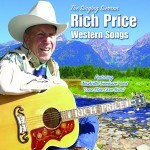 During college years, while he was attending the University of California, Berkeley, Rich was a professional singing cowboy at Yosemite National Park, California. For several summers, Rich sang and played his guitar nightly on open-air stages to national and international audiences of thousands, and then, each day, he would, as a horseback guide, lead trail rides to the tops of the mountain peaks surrounding Yosemite Valley. This singing cowboy also performed for the guests on Yosemite breakfast rides, and at Ahwahnee Hotel barbecues. In June, 2014, Rich was honored to perform at the Yosemite 150th Anniversary Celebration, sponsored by the Yosemite-Sierra Visitor’s Bureau, and Ed Hardy’s Yosemite Natural Wonders Organization at Oakhurst, California. In the year 2000, and again in 2002, The Singing Sierran, and his band, The Sierrans, represented the United States in Beijing, China, at the annual Beijing International Cultural Tourism Festival at the invitation of Director Li Jicheng. At this gathering of nations, the largest of its kind in China, Rich Price was warmly received by enthusiastic Chinese audiences, in and around the cities of Beijing and Wuhan, for this musical ambassador’s style of country and western music. Because of the friendship that developed between Rich and Director Li, and due to the extraordinary, enthusiastic reception of this American cowboy by the thousands who attended the festivals, Director Li extended an open invitation to the Singing Sierran to return to China. Rich is proud and thankful to have visited with some of you nationally and internationally, and is grateful for the many friends within the industry that he has made along the trail. Friends at the San Francisco country music stations honored Rich by asking him to perform on one of their Listener Appreciation Night Concerts that starred George Strait, and Rich is also grateful to have been asked by other industry friends to perform his original songs at the Bluebird Cafe in Nashville, as part of the Americana Music Conference. Rich is also proud to have served twelve years as an Officer in the Intelligence Branch of the U. S. Army, where he became a Major. 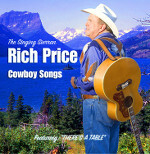 Rich Price, The Singing Sierran, and his band, The Sierrans, perform at your favorite venues, such as fairs, rodeos, conventions and concerts. The Singing Sierran, is looking forward to meeting you, and shaking hands along the trail.